Selective Androgen Receptor Modulators (SARMS) have been a controversial supplement for a while now, with a few athletes found guilty of using illegal SARMS to gain a competitive edge. OstaPlex from High-Tech Pharmaceuticals is the first legal SARMS supplement on the market, and it promises to make a big difference to your physique and performance. SARMS are designed to target muscle tissue (or more specifically the androgen receptors in muscle tissue) to give you the same benefits as anabolic steroids without any of the side effects. If you are looking to use testosterone to boost muscle size then a legal SARM supplement could be the right move for you. 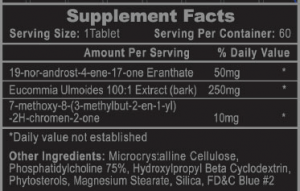 19-nor-androst-4-ene-17-one Eranthate (DHEA) 50mg DHEA is a precursor to either testosterone or estrogen (depending on what the body requires). It can lead to increased testosterone, a slight increase in IGF-1, and a reduction in Cortisol. The dosage of 50mg is just right, though you could safely consume up to 100mg. Eucommia Ulmoides 100:1 Extract 250mg A traditional Chinese medicine that is used to reduce inflammation. It is used here to increase the androgen receptor activity – leading to more testosterone produced. 7-methoxy-8-(3-methylbut-2-en-1-yl)-2H-chromen-2-one 10mg This is a plant based SARM that works in a similar way to anabolic steroids. It mimics the effects of testosterone on muscle and strength. Bottom Line: There are three ingredients in this supplement and all of them are essential. DHEA is there to boost testosterone, Eucommia Ulmoides will help to increase the effect of the DHEA, while the final ingredient will mimic testosterone to produce similar results. Taste & Mixability – OstaPlex comes in pill form so there isn’t much of a taste, and there is no mixability whatsoever. Effectiveness – It’s hard to measure your testosterone levels without taking blood tests, but based on some of the effects (increased libido, improved muscle mass, and lowered body fat) this supplement works. It also does so without a lot of the irritating side effects that testosterone injections come with. 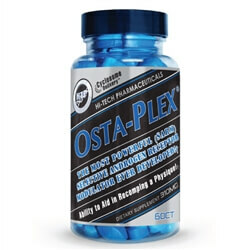 OstaPlex currently retails for around $56 for 60 caps, Obviously, the best way to stay updated on deals & coupons and finding the best price is to sign up to our deal alerts and compare prices on fitness deal news. We’ve looked at High-Tech Pharmaceuticals’ products in the past (check out our review on Synedrine) and have been very impressed with them. OstaPlex looks like another slam dunk, it may seem a bit intimidating to new lifters, and would probably suit a more experienced person. While it is legal to buy, you might want to check if you’re an athlete as the banned list is constantly changing. But for the amateur or professional bodybuilder this supplement is a great way to boost testosterone legally and safely.